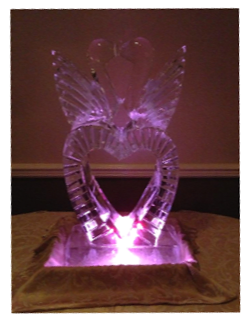 Ice Sculptures give your wedding a real WOW factor!!! It’s never too cold out for a beautiful ice sculpture! The Westwood's talented head chef, Tim, takes his precious time and effort in carving breathtaking ice sculptures upon request! Although these two lovebirds definitely set a romantic tone for the wedding Tim carved it for, ice sculptures make a great addition to any Westwood event!! For example, a party may request huge numbers carved out of ice for high school proms or reunions, commemorating the year of the class being celebrated! As you can see, we use colorful lighting to give our sculptures even more visual appeal, but it doesn’t have to stop there! Some common uses for ice sculptures at events have been ice-carved shelves, bowls, oversized martini glasses, and elaborate luges! The possibilities are endless, and Tim is ALWAYS up for the challenge here at The Westwood! Trending Now: Wedding Shoes with Color! Who says a bride can’t be colorful on her Wedding Day? Not the Westwood! Here’s a fun new way to incorporate your “something blue” and dress up your gown! 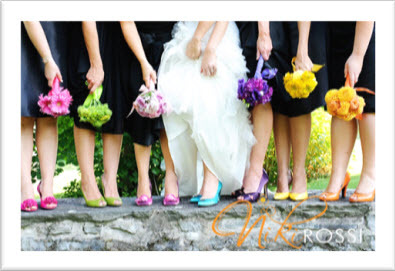 Bright and colorful shoes give you and your bridal party a special uniqueness that will really turn heads at the ceremony and reception, not to mention all the adorable pictures you can take!! This season keep an eye out for autumn colors like red or orange on our blushing brides and her bridesmaids! What Wedding Dress fits you this time of year? 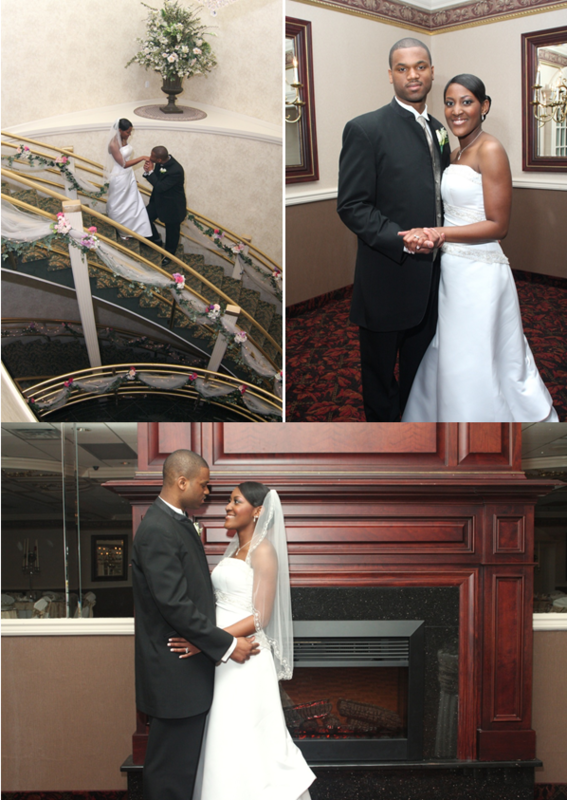 Weddings can take place at any time of year: summer, winter, spring, fall; The Westwood sees and plans it all!! Many brides may not know this, but different style dresses are worn more appropriately according to the season their special day takes place. 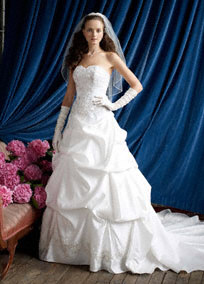 During the spring and summer seasons, perhaps a bride would want to wear a dress that is slim flitted and light. Ball gown dresses with a lot of tulle and heavy material may be uncomfortable in the hot summer months, and what bride wants to be sweaty on her wedding day?? Another recent trend has been for brides to wear tea length or cocktail length dresses as opposed to long, floor length gowns. These dresses are more light weight, and even if they have some tulle it won’t weigh you down or exhaust you! Check out this cute summer dress from David’s Bridal! Perfect for a beach or destination wedding! During the fall and winter seasons, however, the styles of the dresses change. Typically in the coolermonths, some brides prefer to go with a thicker fabric and full length wedding gown. Shrugs and matching sweaters have also become popular for these winter brides, and many even opt for sleeves or long gloves, like our David’s Bridal bride to the right! Her long gloves and full, floor length gown make the perfect winter wedding combination! For some brides, finding the perfect wedding dress isn't always that easy, but The Westwood is always more than happy to help a future bride in planning her wedding and pointing her in the right direction! Who says brides can't go crazy with accessories?! The Westwood sure doesn't! A bride can wear as much or as little jewelry as she wants on her Wedding Day! Accessories are a fun way to jazz up the traditional white wedding dress and add personality or sentimental significance to the wedding day ensemble (something borrowed, anyone?). 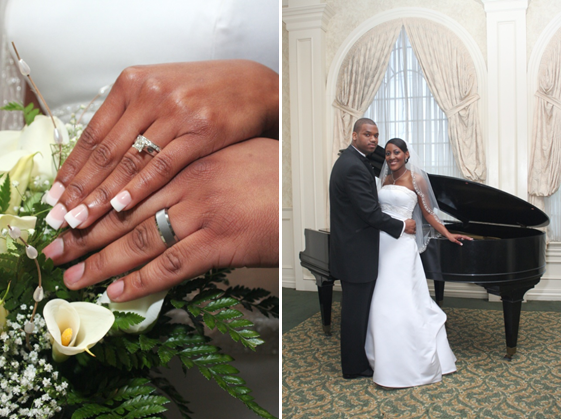 Follow these tips to add some bling to your special day the right way! A necklace is almost always a must for any special occasion! However, depending on the cut and neckline of your wedding dress, you may decide to skip this accessory. If your dress has a high neckline (a recent trend has been vintage lace collars) or a lot of sparkles and embellishments, adding a necklace might be a little too much and the beauty of the piece can be easily overlooked and underappreciated. Pearl necklaces are a great bridal accessory as they go well with almost any neckline. Some brides may wear pearls belonging to mothers, grandmothers, or aunts to serve as something borrowed, and to add sentimental value to their bridal look. If your wedding gown has a halter top, something simple and elegant is best. A statement necklace could take away from the gown and the embellishments of the halter top, and also come across as too busy or distracting. When wearing a dress with a halter top, it’s best to play up your ears! When choosing earrings for your big day, be mindful of the size and style of the necklace you’ll be wearing. If you’ve already chosen to wear a large or sparkly necklace, perhaps pearls, small hoops, or diamond studs are best for your bridal look. Long, drop earrings are a great match for halter tops and sweetheart necklines as well! Most brides wear veils on their big day, but what will be underneath yours when you take it off for the reception? Not bland, boring hair I hope! Accessories like flower pins, jeweled headbands, and crystal pins or clips can make a huge difference in your bridal hair and give you more opportunities to accessorize and express yourself! When it comes to accessories, less is more, but most importantly, accessorizing is about YOU. On your big wedding day, you want your personality to shine through your bridal look. Wear what you are most comfortable in and what really speaks to you. Don’t feel pressured to do anything drastically different or trendy for the sake of following a trend. 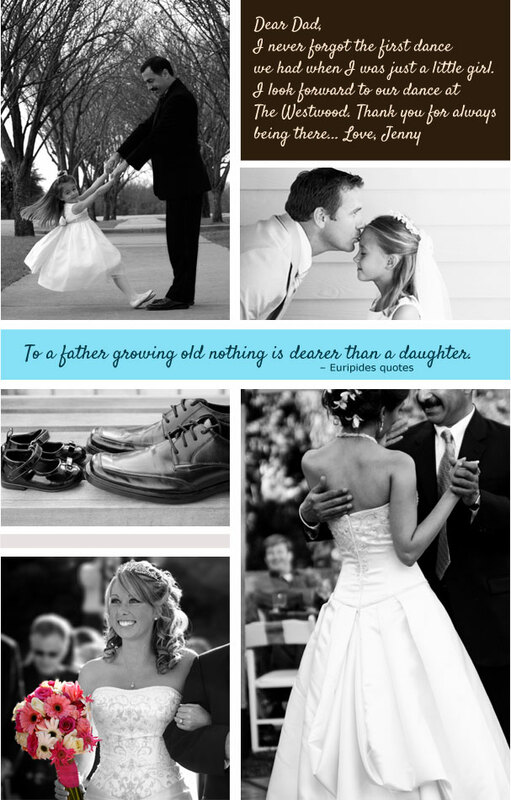 You come first on your wedding day, and you should feel happy, comfortable, and confident!! 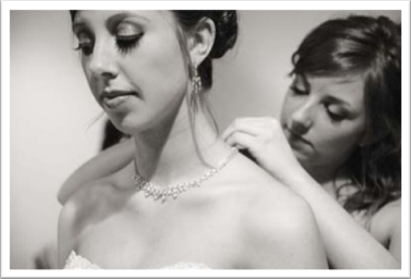 For over 50 years we have been specializing in smiling brides. But, that’s not to say we are set in our ways, quite the opposite. We understand that this is the event you’ve waited a lifetime for and you are looking for food, flowers and fun that represent your unique style, not a cookie cutter event. We work closely with you on every detail, including your budget – we know you want every last detail accounted for and that’s what we do best. The Westwood can recreate any theme, color scheme or style that you’ve dreamed about. From traditional to contemporary and every shade in between, we execute exactly what you are looking for... come take a look around. With an in-house creative floral department we are uniquely qualified to have your overall wedding theme work effortlessly with both your ceremony and reception. 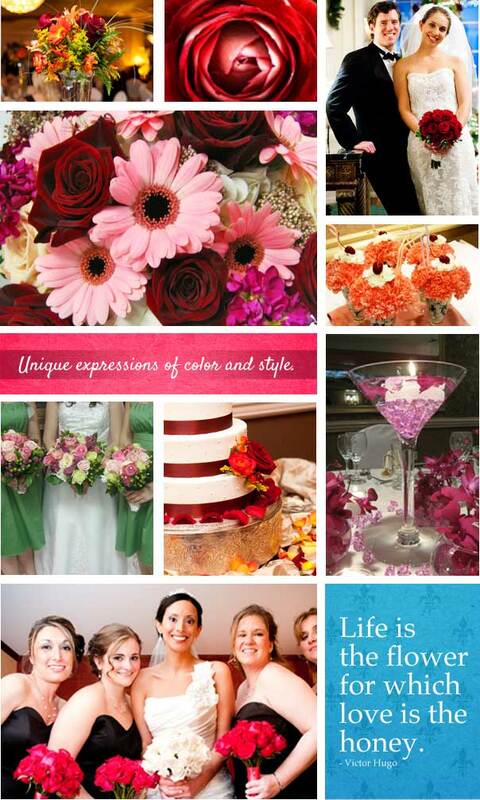 Our floral designers take your vision and represent it through color, style and function. They always have new ideas to make your flowers different from other weddings you’ve been to, and they will manage the delivery of flowers to your offsite ceremony as well. The Westwood catering facility and floral department combine to make your event a cohesive, exquisite event! Why choose two different partners when you can have just one? !